If for any reason you are unable to manage your project, we have experienced staff that can do this for you, from start to finish. This is one of our core skills. Our Licensed Cadastral Surveyors can carry out a redefinition survey to identify and mark the true boundaries of your land for building consents, erecting fences avoiding neighbour disputes. When there maybe changes to the property boundaries, a land title survey is required and a new survey plan is prepared and electronically submitted to Landonline. Our Surveyors must first search survey plans in the area then locate old boundary or reference marks and prove their reliability before accurately defining the new or existing boundaries. Our experienced Tauranga surveyors can guide you through subdivision and the land development process interpreting the rules and regulations of local authorities and Land Information NZ, obtaining the necessary resource consents. We can update your footprint of the building to reflect any alterations that have occurred to the property, such as a new conservatory or an extension and update the legal title. We can submit the necessary Resource Consent applications to Council for conversions or updates. Before any design of a new development can be done, Latitude Surveying Ltd can provide a topographical map of the subject land for your development. By recording any information about physical features of the land, we can provide an electronic drawing to your Architect/Designer in a DXF or DWG file. Daylight, Floor Level and Total height compliance is required by most Councils for large buildings being erected on small sites. We can provide the necessary certificate signed by our Registered Surveyors used by Council to support the application for Building Code of Compliance. Our land surveying services include GIS Data Surveys. Councils and other statutory bodies are required to have an up to date register of their assets. We can collect the data for the register and record position, type, condition, etc for integration with the established GIS system being used by our customer. Latitude Surveying Ltd can undertake detailed engineering surveys and design for road construction, stormwater and sewer drainage, and water supply reticulation. Before site works commence we can identify that the boundaries have been properly defined so that the setout of building foundations can be carried out. When constructions of services have been completed our surveyors can create ‘As-Built’ drawings for clients and/or the district council. We can regularly monitor the movement in buildings or ground levels over regular timed intervals. 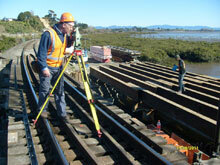 Latitude Surveying are ZESPRI Approved Surveyors. ZESPRI have entrusted Latitude Surveying to provide accurate GPS measurement of kiwifruit canopies as part of their licensing process requirements.